Up and out of the trenches, American troops attack in 1918. Photo published by Editions de la Martiniere, Paris, France. ESSEX — The American History Book Club of the Essex Library will hold a discussion on , “Yanks,” a book by John S. D. Eisenhower about America’s role in World War 1 on Thursday, March 19 at 6 p.m. at the library. The library is located at 33 West Avenue in Essex, and members of the general public are invited to attend the discussion. Copies of the book, “Yanks,” are available on loan at the Essex Library, although the supply is limited. John S. D. Eisenhower, who was the son of President Dwight D. Eisenhower, was a graduate of Point and a retired Brigadier General in the Army Reserve. Eisenhower, who died in 2013, was also a prolific author of books about war, including, “Better Wood,” an account of the Battle of the Bulge, and “Agent of Destiny, a life of General Winfield Scott,” among others. In all, 12 different war books by Eisenhower are listed for sale on Amazon. 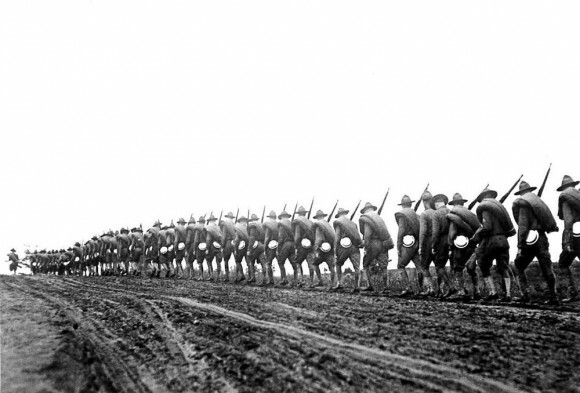 American troops march in line to the front in 1918. Photo published by Editions de la Martiniere, Paris, France. Whether America’s World War 1 allies, France, Great Britain and Italy, would agree with this conclusion, it is undeniable that when the fresh American troops joined the war weary allied troops in 1917, a path was opened to the defeat of the German army. Crucially, in the summer and fall of 1918, American Army forces turned back five major German army attacks, and then advanced significantly into German occupied territory as well. 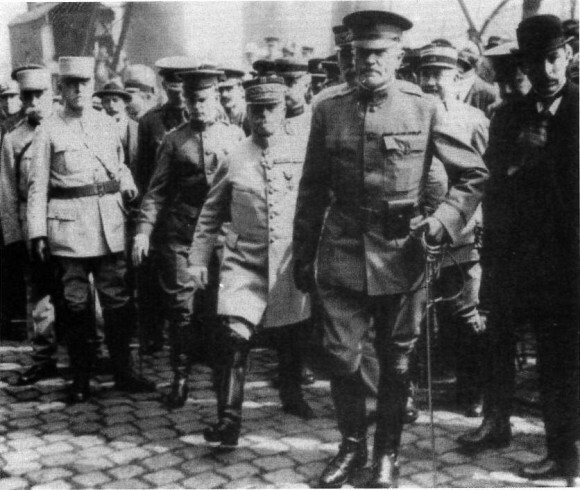 Major General Pershing lands at Bordeaux in June 1917. Photo from “Yanks” by John S.D. Eisenhower and published by The Free Press, New York. As “Yanks” makes clear, the personification of the America’s involvement in World War 1 was General John J. Pershing, the commander of American Army forces in Europe. Early on, the British generals had suggested that the arriving American troops should be used to fill in the rosters of the British lines, as needed. Pershing, vehemently, rejected this suggestion, making it a rule that American troops would fight only in American units. They would, definitely, not serve as “fill ins” in the British lines at the front. Also, when the allies and Germans were negotiating the armistice that ended the fighting in World War 11, Pershing argued strenuously that the war should continue until Germany’s unconditional surrender. Not only was Pershing’s voice not heeded, but he could have been disciplined for expressing a dissident point of view, although that did not happen. “Yanks” is sometimes dense with detail, as the author meticulously reviews the battles in which the American troops were engaged. However, the book is well worth reading, so as to learn America’s role in a major chapter of world history, World War 1. 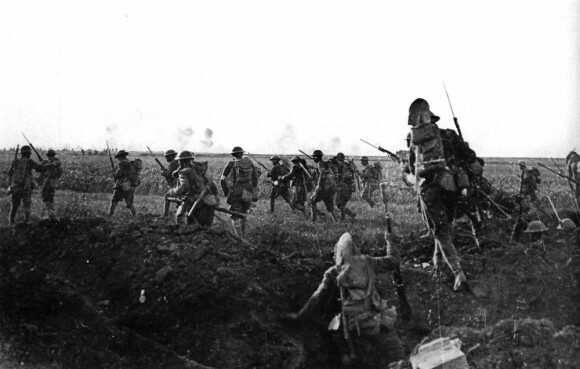 Although not mentioned in “Yanks,” World War 1 is considered to be the deadliest conflict in human history. The death tolls were staggering. America lost 116,526 killed, Great Britain 908,371, France 1,357,000, Germany 1,777,700 and Austria/Hungry 1,200,000. Also, Russia lost 1,700,000 until the new Communist government removed Russia from the conflict.